Twin gables and a generous front porch give this graceful farmhouse stature and appeal. Nine foot ceilings on the first and second floors contribute to the home's overall spaciousness, while vaulted and cathedral ceilings amplify the great room and master bedroom. A rear deck adds outdoor expansion to the great room, which features a fireplace, built-ins, convenient rear staircase, and overlooking balcony. 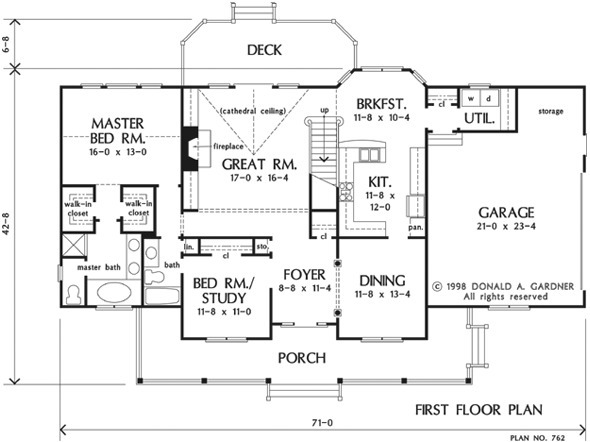 The first floor master suite enjoys his and her walk-in closets and a private bath with garden tub. 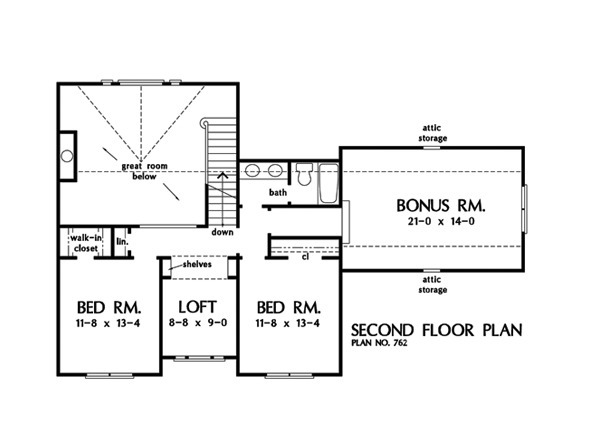 A versatile bedroom/study and full bath are nearby. Located upstairs are two family bedrooms, separated by a loft with built-in bookshelves, a liberal bath, and bonus room. 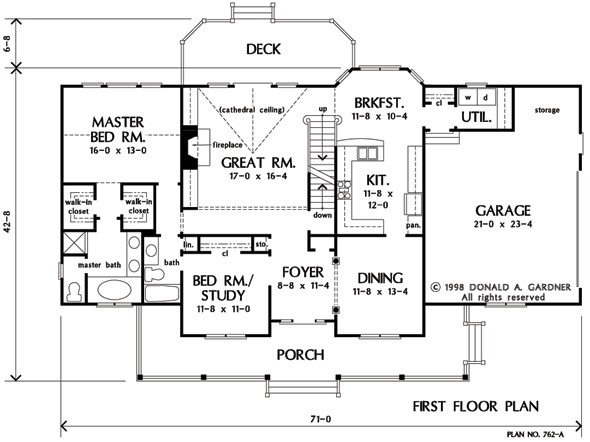 House Dimensions: 71' 0" x 42' 8"
Great Room: 17' 0" x 16' 4"
Balcony : 8' 0" x 9' 0" x 9' 0"
Bedroom #3 : 11' 8" x 13' 4" x 9' 0"
Bedroom #4 : 11' 8" x 13' 4" x 9' 0"
Bedroom / Study : 11' 8" x 11' 0" x 9' 0"
Bonus Room (Vaulted): 21' 0" x 14' 0" x 9' 5"
Breakfast Room : 11' 8" x 10' 4" x 9' 0"
Deck / Patio : 23' 10" x 9' 0" x 0' 0"
Dining Room : 11' 8" x 13' 4" x 9' 0"
Foyer : 8' 8" x 11' 4" x 9' 0"
Garage : 21' 0" x 23' 4" x 0' 0"
Great Room (Cathedral): 17' 0" x 16' 4" x 18' 1"
Kitchen : 11' 8" x 12' 0" x 9' 0"
Loft / Study : 8' 8" x 9' 0" x 9' 0"
Master Bedroom (Cathedral): 16' 0" x 13' 0" x 14' 8"
Porch - Front (Flat): 45' 4" x 6' 0" x 10' 0"
Storage (1st Fl.) : 2' 0" x 2' 0" x 9' 0"
Utility Room : 7' 6" x 5' 8" x 9' 0"